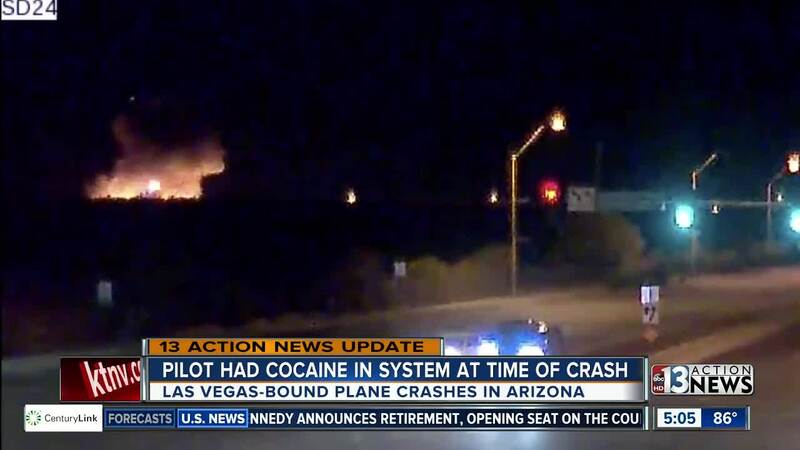 UPDATE JUNE 28: New information says one of the pilots involved in the crash of a plane headed from Arizona to Las Vegas had cocaine in his system at the time of the incident. The information was released by the Maricopa County Medical Examiner's Office. However, it was not revealed who tested positive for the drug. It also has not been revealed who was flying the plane at time of crash. A final report from the National Transportation Safety Board will be released next year. LATEST: The family of one of the victims is seeking answers after their daughter is killed in a private plane. "This is something that could've been simply avoided," said Kash Christopher. Christopher is the father of Helena Lagos. "I have a lot of questions, considering my daughter was on that aircraft," he said. The NTSB is investigating whether the Piper PA24 was a model that could have safely carried six people. Right now, investigators are not jumping to any conclusions. Elena Pineda says Helena was her only child. "My heart is broken," she said. "The life that I knew is over, and all I can think is how scared she must've been." Loved ones have started a memorial fund to help cover expenses. UPDATE APRIL 11: 13 Action News confirmed the flight was on its way to Las Vegas when it crashed in Scottsdale, Arizona. All of the victims of Monday's plane crash have been identified. His twin brother remembers Anand Patel. "I think I loved my brother more than anyone else," Akash Patel said. "It was a brotherly love only twin brothers understand how much we love and care for each other." Business Insider reports several of those on board were Instagram stars. ORIGINAL STORY: Six people are dead after their single-engine plane crashed last night on a golf course in Arizona. It happened just after the plane, which is reportedly a Piper PA24, took off around 8:45 p.m. Monday in Scottsdale. 13 Action News has heard that the plane may have a connection to the Las Vegas valley. We are still trying to confirm that information.